All Canadian taxpayers who file a T1 or T2 tax return, and develop new products, or enhance/modify/improve existing products or technological processes can apply. • What Expenditures Are Eligible? All project-related expenditures can be submitted. These typically include: salaries and wages, materials, work subcontracted to other Canadian taxpayers, and capital equipment. • How do we know if we qualify? A common misconception is the belief that the SR&ED tax credit program was created exclusively for the high-tech sector. SR&ED is not performed in laboratories only. It can happen in an office behind a computer or on the shop floor. When modifying a product to make it more durable or precise or when altering an internal process to make it more profitable or efficient, workers are not necessarily “just doing their job.” The work they are doing may actually be experimental development and might qualify for an SR&ED tax credit. Fields which may qualify for SR&ED tax credits and refunds include engineering, design, operations research, mathematical analysis, computer programming, data collection, testing, and psychological research. • How many years back can be claimed? SR&ED claims must be submitted within an 18-month window after the end of each fiscal year. If your company’s fiscal year ends on June 30, then December 31, 2010 is your deadline for filing your 2009 SR&ED claim. There are opportunities where companies are able to file two SR&ED claims immediately. In this scenario, your Company will receive a government cheque for both fiscal periods at the same time. • What is the average refund? Refunds depend on several factors, including the strength of the projects and your company’s payroll. The average one year refund for our clients is $80,000. • If our research is unsuccessful, or our experiments fail, can we still qualify for SR&ED tax credits? Failures, abandoned or postponed projects still qualify for SR&ED credits as long as they meet the eligibility criteria. The success or failure of experimentation is not a factor in determining whether the work performed qualifies for SR&ED credit. • What if our work is not new? • How Long Will It Take To Process Our Claim? • Will My Entire Business Be Audited If I Apply For SR&ED? No. Historically, government auditors enhanced their careers by the volume of dollars recovered from taxpayers. SR&ED - on the other hand - is an incentive program to encourage innovation in Canada. The SR&ED reviews are separate from the CRA audits. For example, Revenue Canada clearly indicates in its publications that the SR&ED reviews do not extend into full business audits. • We think we qualify for SR&ED. What is the next step? Our experienced team of consultants can evaluate your company’s eligibility for SR&ED tax credits and refunds, and identify qualifying work and expenditures. Our Technical writers will assist you in writing project descriptions in the most precise and up-to-date language required by the CRA. Our strong service offerings on the financial, taxation ,and technical side enables us to control the quality of the entire claim process resulting in an outsourcing of the entire process to a single source. Employment Insurance is a social program that contributes to the security of all Canadians by providing assistance to workers who lose their jobs. A portion the employee's paycheck is submitted to the government. The employer also contributes 1.4 times the amount that is deducted from the employee. This is done so that the government EI pool has a surplus in order to assist Canadians if they were to suffer job losses, and help them get back on their feet. • Why Canadian Refunds Inc? 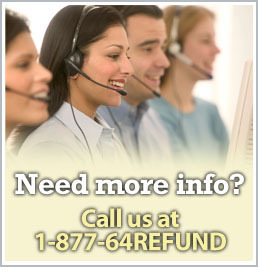 As specialists in the recovery field, we know what we are looking for in terms of refunds. Determining EI eligibility and wading through the ruling process can be an extremely stressful and time consuming task. If you don’t understand the process, the jargon, file the wrong paperwork, miss a deadline, or say the wrong thing, your claim will be denied and you will be mandated to continue paying premiums forever. Furthermore, you still may not even be eligible to claim EI benefits! Unlike the more traditional nature of income tax rules, the eligibility section of the EI Act is subjective, not universal to every situation. Accountants are often unfamiliar with the unfair bureaucracy involved in obtaining an EI refund, and will therefore prefer to avoid it entirely. Accounting firms bill by the hour and are simply not setup for the contingency model. With Canadian Refunds Inc., if we don’t save you money, you simply don’t pay. We have an extremely successful track record in attaining the maximum refund for our clients, and ensuring that they never have to pay EI premiums again. In fact, much of our business is referred to us by accounting firms because they want their clients to get the best available service and value. • What is the definition of “related” employees? Children - sons, daughters In-laws, step-children, and Grandchildren. Spouses - Wives and Husbands, including Common-law partners. Parents - Mothers and Fathers including In-laws, Step-parents and Grand-parents. Siblings - Brothers and Sisters including brother/sister In-laws and Step-siblings. It is not necessary for related employees to own any shares in the business to qualify. • How many years can be retroactively refunded? The law states that we can go back 3 years. However, it usually ends up being closer to 5 years that will be recovered. The law states that we can apply for a refund of 3 years from the year in which the filing is done - in addition to the year in which the filing is made. If we can file the application before December 31, the current year would be the 4th year. Furthermore, we will also be recovering the EI payments you make the next year, giving you close to a 5 year refund. Additionally, once we receive a ruling on your behalf, you will be exempt from ever paying EI in the future. • What do you mean I am not eligible? I contribute on every paycheck! Paying premiums does not make you eligible for benefits! You can overpay your premiums forever and never even know that you were not eligible. Getting them back however is a more difficult task and becomes unfair and confusing to those who are not experienced with the system. If your family controls the company that you work for, and you are deducting EI and have never received EI benefits or been ruled upon before, then this recovery option applies to you. • Does the Company get money back as well? Yes! Companies contribute 1.4 times the contribution of each employee and both will get their refund PLUS interest on the overpayments. • How much money are we talking about? If we can get your application in before Dec 31, we could be looking at a refund of in excess of $8000 plus close to $2000 in savings per year forever. Multiply this by each relative and you have a huge amount of potential savings back in your pocket. As an example, If the related employee works there for another 15 years, the future savings can add up to over $32,000 per family member. • If and when I ever get laid off and apply to collect EI - how will the Government ever know if I'm related to the owners of the company? Question 35 of the questionnaire that you are required to submit in order to collect EI - asks if you were related to the owners of the company. 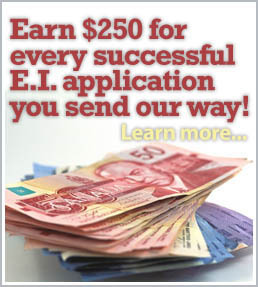 The government will perform due diligence to enforce this clause before paying out EI. If you don't answer this honestly you may be committing fraud and subject to fines and penalties. • Can I just stop paying the premiums now? It is not advisable to just stop paying. The consequences of stopping deductions without following the proper procedures may result in additional assessments, interest, penalties, and the loss of your refund. We don’t just get you a refund for past years, we will get you a written ruling from the CRA ensuring that you will not have to contribute going forward. • How much time will I have to invest in this? When can I expect my refund?